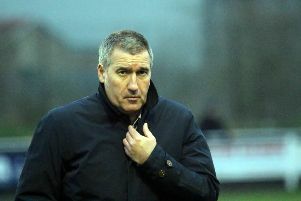 The only positive note for Banbury United manager Mike Ford from Saturday’s Evo-Stik Southern League defeat against Tiverton Town was his side’s overall performance. Despite the Puritans producing arguably their best football of the premier division campaign, they lost 2-1 against Tiverton, paying the price for conceding two late goals. Meanwhile, United’s next opponents Kings Lynn Town went down 1-0 against Chesham United. So they will be keen to get back on track on Tuesday night at the Banbury Plant Hire Community Stadium, as will the Puritans. Ford has added former Brackley Town midfielder Elliot Sandy to his squad but United will be without Ravi Shamsi who starts his three-match suspension while Ricky Johnson is available again. United’s young defenders will not have to face the experienced Grant Holt after all as the much-travelled former Norwich City striker left the Linnets following Saturday’s defeat and has joined one of his former clubs Barrow as player-coach. Ford said: “We have to find a solution to stop us losing leads in games, it’s happening too often and costing us.